What is steam pressure washing and how can it benefit you? Steam pressure washing is used for both commercial and industrial cleaning applications. Over the years, pressure washing has improved and today's models offer the most flexibility and power than the industry has ever seen! Whether buying your first one or upgrading an existing pressure washer, there are now many more options available to you. We're going to take a down and dirty quick look at your options in using high heat to clean and sterilize and how you can select the unit and attachments that make the most sense for you. To fully understand the use of a power washer for steam washing, you need to know how they work. The units heat water to over two hundred degrees to vaporize the water and is very effective at melting and removing animal fats, grease and other substances. These durable power steam cleaners are designed for tough cleaning applications and are heavily used by the military and other organizations that demand durable products. 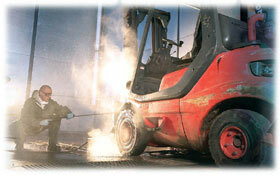 Steam pressure washing combines the power of steam with the strength of pressure to efficiently clean tough buildups. The other benefit is the high temperature allows for surfaces to be sterilized. There are different types of steam pressure washing units available and many different types of steam cleaning methods. Below are some of the features you can typically expect to get with an electric powered unit. Pressure washers are the number one choice for degreasing and removing oil, sterilizing, disinfecting, dissolving resins, melting, thawing ice buildup, flushing away chemicals and poisons, and degassing. Hot water pressure washing are used in shops and other facilities where encrusted dirt, grime, and other dried on substances accumulate. Conversely, cold water pressure washing units are great for vehicles, facilities, and ground maintenance areas such as sidewalks and architectural embellishments. Hospitals also use steam to sanitize and sterilize sensitive areas. Sanitization simply means applying high heat to a surface to kill microorganisms. When you are involved in steam pressure washing, you will need to perform maintenance to your unit. Maintenance of your pressure washer keeps your steam pressure washing unit working to its fullest potential. If you want to truly get the most of your washer unit, you need to make sure you clean it and store it properly. Since this is a totally separate topic, you can read our proper maintenance of your pressure washer article here. Advantages of using steam pressure washers over cold water system models. Learn how and why a hot water pressure washer can save you time and increase your efficiency.